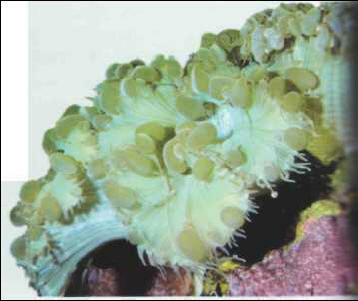 The species in this genus, known as bubble corals, are quite easy to keep in an aquarium. The daytime "bubbles" withdraw at night to give way to stinging tentacles 1-5 cm long. In the wild, the bubbles provide the coral with a certain degree of protection, as the tentacles are not attacked by fish (butterfly fish, for example). The color of the bubbles varies depending on the presence of Zooxanthellae, and these mean that this coral requires strong lighting. It is best to feed it at night - when the tentacles are unfurled - with relatively large, live prey. It is also possible to accustom it to eating a fine choppy based on seafood between the bubbles by day. Avoid allowing the bubble coral to touch other invertebrates, on account of its capacity to sting. Size: 20-30 cm. РУРК (Rourke) Мики (наст . имя Филип Андрэ) (р.1956), американский киноактер. В кино с 1979. Первая значительная роль в фильме Л. Каздана "Жар тела" (1981). Наиболее известные фильмы: "Девять с половиной недель" (1986), "Сердце ангела" (1987), "Дикая орхидея" (1990) и др.